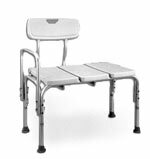 The Probasics Blow Molded Transfer Bench w/Adjustable Legs - Set of 2 offers tool free assembly. 3 Panel blow molded seat and back rest. Adjustable from 18-23” floor to seat height. width between legs 16.5”D outside legs. length between legs 29.5”W outside legs.